The 44-kilometre Obajana?Kabba concrete road project in Kogi will be ready in December, the Managing Director of AG-Dangote Construction Company, Ashif Juma, has said. Mr Juma, who stated this in a statement obtained by the News Agency of Nigeria (NAN) in Lokoja on Monday, said that the longest concrete road project in Nigeria was being built according to specifications. According to him, so far 33 kilometers earthwork and 22 kilometres concrete pavement have already been accomplished. ?We will deliver the project by December this year as planned,? Mr Juma said. He urged government at all levels to switch over to construction of concrete road instead of asphalt as it is far superior, durable and cheaper, as it does not require frequent maintenance. The statement signed by Anthony Chiejina, Corporate Communication Officer, Dangote Group said that the Obajana-Kabba rigid pavement road project was part of the Corporate Social Responsibility (CRS) of the Dangote Group Plc. ?Concrete road last longer than asphalt roads and do not have potholes. It does not require frequent maintenance as asphalt roads. It saves fuel for motorists and protects tyres from wear and tears,? it said. According to Mr Chiejina, it is part of the Group?s determination to support government and Nigerians in order to grow the economy and facilitate ease of doing business. The statement also quoted the President of Dangote Group, Aliko Dangote, as expressing worry over the huge amount being spent on repairs of asphalt roads across the country. 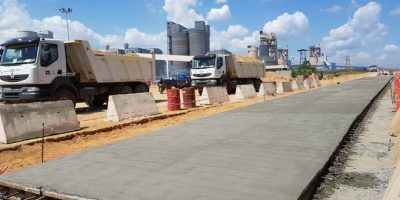 Mr Dangote, who spoke at the inauguration of the 26-kilometre Itori-Ibeshe concrete road project in Ogun State, said plans were afoot to revolutionise Nigerian roads with concrete.